Not so long time ago, Steel Mastery finished handcrafting of the full-plate Churburg-style armour of the XIV century. And next to the Gothic armour, we’d like to tell about equally well know armour from the Castle of Churburg. Starting the XIV century, handcrafting of armour in Milan raised to the higher level of quality. Many French, English and German knights were aimed to purchase plate armour, which was made by Lombardic and Milanese armourers. There are a lot of documents, according to which not only manufacture, but also delivery of Italian armour to the other countries had been rearranged. In this sense, unique collection of plate armour, keeping in the Castle of Churburg is very illustrative. This castle is located in South Tyrol, and it was a part of German land. During centuries, the castle belonged to two families - to Matsch and to their heir apparent Trapp. In the Armoury of castle, base of which was established by Jacob VII Trapp (1529-1563), knight gear of both families is kept up to now. The Castle of Churburg. The Armoury. Plate armour, being made by Milanese crafters, was belonged to “white armour” and covered almost full body of knight. The earliest exemplars are named Churburg armour and are dated the end of the XIV century. Parts of the armour shown below, probably were in the different armour sets. But officially, this full-plate armour was belonged to Ulrich IV von Matsch (XIV century). Initially, mail aventail was used together with breastplate to protect the neck. Later, body of knight was covered with circular-shaped cuirass, to which more movable rounded part had been attached with belts. This part were closing the bottom part of chest, so such construction allowed the knight to bend down without restraint. Back plate was also attached to the front part with belts and consisted of parts similar to the front parts. On the right side of breast plate, the was a hook - queue. Under the breastplate, knights often wore mail shirt to protect the parts of body, uncovered with plate parts of armour. You can see an interesting detail on the Churburg-style armour - there is V-shaped strip, attached to the upper part of breastplate. Quite likely, it was used as a safety measure to protect the neck of the slipped spear of enemy. Breast plates from Armoury of the Castle of Churburg. Plate skirt - faulds, consisting of one or several plates - was attached to the bottom part of breast plate for hips protection. Often, additon plates was added on the early armour - so called tasses, which protected upper part of thighs. Approximately from the 1425, breast plate, upper and bottom plates, and part of faulds had become to be attached together with hinges from one side and the leather belts with buckles - from the other. At that, vertical buckles on the breast had been started to be placed higher, and in time three buckles had been replaced with one only. Churburg style armour of the XIV century is characterized segmental spaulders, which consist of few curved plates, attached to each other. In time, spaulder became larger and often asymmetrical. Left one was larger the the right one, and both of spaulder are almost contacted on the back side. Such type of spaulder was in use during the XV century. Full-plate bracers were rather long to cover forearm and some part of arm over the elbow. Elbow in its turn was protected with heavy elbow caps with rondels. In time, as a spaulder, left elbow cap has become larger and was covered with enforced shell-shaped plate. It allowed to blow the hits, which usually were fallen exactly at this body part. Besides, so large elbow caps allowed the knight not to use the heavy and unhandy shield, that surely improved the speed and mobility of warrior. Plate “hourglass” gauntlets were a type of glove or mitten. Hand plates were prolonged to the fingers and had double attachment with them. Also, there was one more wrist bend. In years, wristband become longer and almost cover the forearm. Full-plate legs with knee caps protected front side of the leg. Double-wing greaves had hinges and leather belts with buckles for fixation on the calves. Caps had rondels with wide flute in the center. Such rondel hidden uncovered back part of knee, and the central flute fixed the hit. Sabatons - plate shoes - had not so pointed top as their late fellows. But anyway, there we used not too often, as they detained walk and run. Few types of helmet typical for these times complete plate armour of the Castle of Churburg. First of all, there are two or three helmet of type bascinet “Hounskull” (“Hundsgugel”) with pins on the sides as a system of visor attachment. Such visor had narrow eye and mouth slits. On one or both side of visor, there were holes for breathing. The Armoury of the Castle of Churburg has bascinets in very good condition (even with liners stuffed with wool) nowadays. Bascinet from the Castle of Churburg was weighed about 5.5 kg, and weight of full-plate Churburg-style armour was about 30-40 kg. Recent researchers set up an experiment. The results of it contradict the opinion of the great historian Claude Blair, the author of “European armour, circa 1066 to circa 1700”. 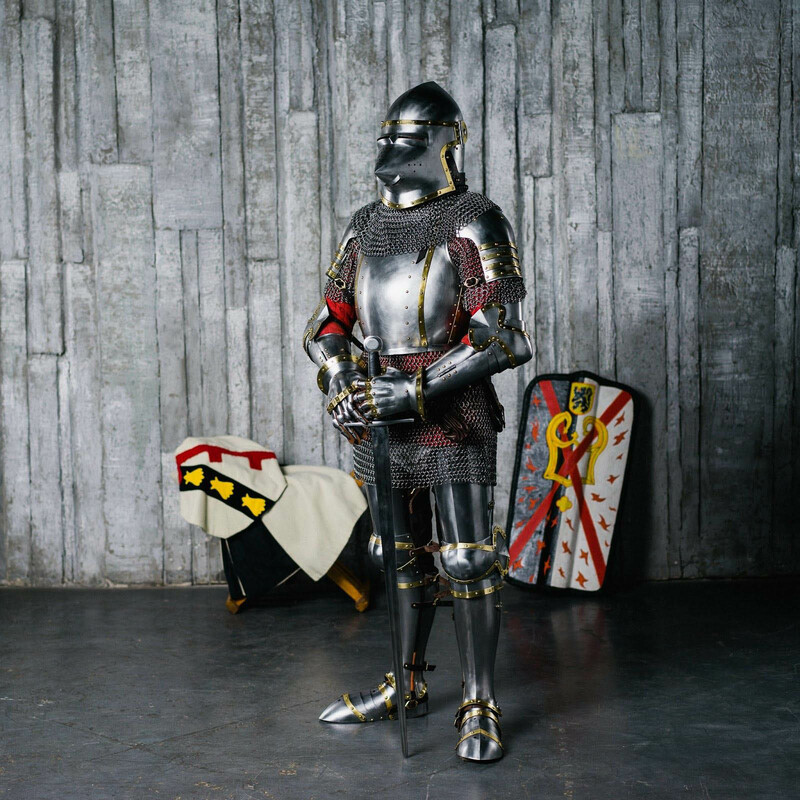 He claimed, that plate armour did not put the owner to physical troubles, so it was not so hard to move and to fight wearing the armour, as it seems us now. During the experiment, healthy young man had been suggested to wear full plate armour and to do some physical exercises on the exercise equipment. Special device detected the pulse frequency, breath and energy demands. Research suggested, that when running, energy requirements were beyond the identical rates of a man wearing the usual clothing. And when walking, efforts were increasing twofold. Also, deep breathing is not possible in such outfit, so a man had to make frequent short inhales, and got tired faster. Well, we cannot but admire staying power of the medieval knights! Now people, taking participation in medieval tournaments or go for HEMA or HMB, have wonderful opportunity to feel themselves a real knight! And in our turn, Steel Mastery may help you, crafting not only beautiful, but historically correct armour! You can see all our full armours here. We used some information and illustrations for this article from Rudolf H.Wakernagel, Ian Eaves “The armory of the castle of Churburg” , Mario Scalini “L’Armeria Trapp di Castel Coira”, Claude Blair “European armour, circa 1066 to circa 1700”, Dr. Sabina Kasslatter “Museums of South Tyrol” and everpresent web:) Pictures, not belonging to "Steel Mastery", are taken from the web. We do not pretend to be an owner of them and use them as illustrative example only.